It’s that time of the year again, when we as a nation celebrate our independence by grilling out meat and setting off fireworks while hanging out with family and friends, sharing a good drink and fun stories. 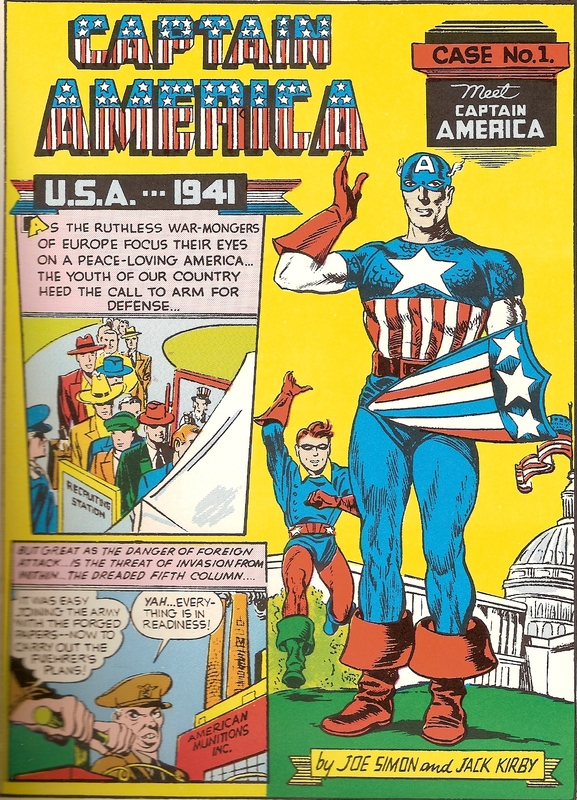 That’s right, it’s July 4th and here at Rotten Ink that means I am going to take a look at an American themed comic book hero, and this year I decided not to mess around and go straight to covering the one and only Captain America! We will be talking about his first issue and his very early history before Marvel owned his rights and he was being published by Timely Comics. As always, I will try my best to make this update go by super fast as I know that many of you like myself have cookouts and fireworks in your future for tonight. And I will say that while this is my first time talking about Captain America, it will not be the last time I talk about this Star Spangled Avenger! So with America pride at a fever pitch this holiday, it’s my great honor to bring to you this American Icon Captain America update! In 1940, Joe Simon was messing around with a new idea for a comic book war hero and doodled a character he loosely was calling “Super American,” but after thinking about the name of this new character he decided that the world of comics had so many Supers and that’s when he came up with the name Captain America! Then he came up with the character’s sidekick Bucky who was named after his friend who was a basketball star in his high school. After pitching it to Martin Goodman, who was the publisher of Timely Comics who later would become Marvel Comics, the comic series was green lit and went into a quick deadline production. Simon brought on his long time friend and calibrator Jack Kirby to do the art as well as really design and bring the character to life. Simon and Kirby would add in their views about the horrors of what the Nazis were doing at the time, and it was their way of taking a stand. Also brought on board to help bring Captain America alive was Al Liederman who inked, and Howard Ferguson did the lettering. 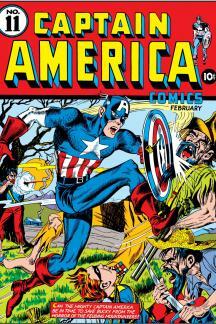 The first issue was released on March 1941 and was a hit with comic readers of the time and became the top American themed superhero of the time, a title he still holds to this very day. 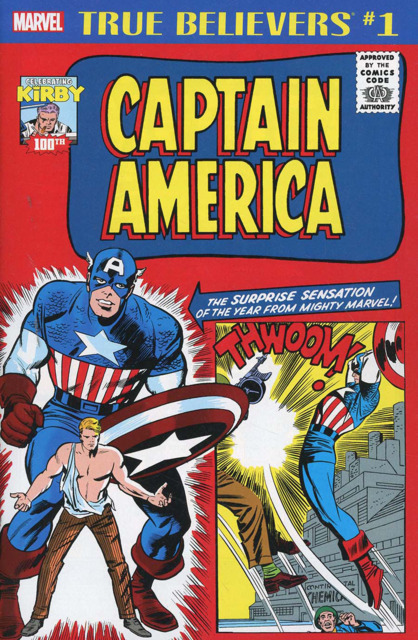 The comic became one of the biggest comics and printed media of its time showing that the American people needed a superhero like Captain America. 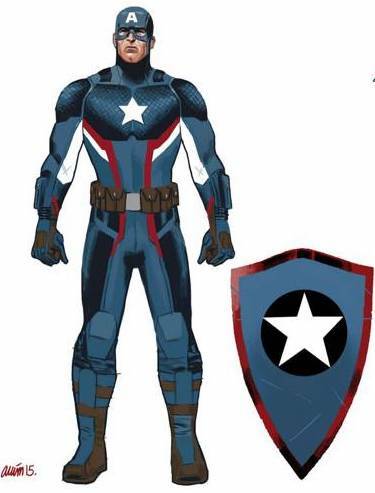 During this time MLJ was upset as they felt that Captain America’s shield looked too much like the symbol on used on the chest of their patriotic hero The Shield and this caused Simon and Kirby to change Cap’s shield to look more round. This of course became iconic to the character’s look. The character would run for many years and even tried his best to stick around after superheroes fell out of favor with comic book readers. During this time he created a team called the All-Winners Squad and even dated a superheroine named Golden Girl. 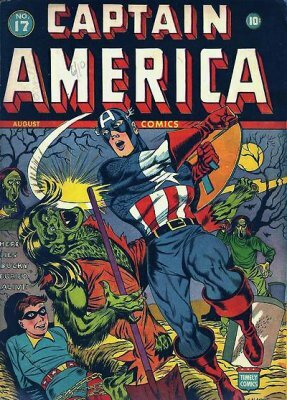 But while they tried to save Captain America from the hero crash by adding in elements of Horror, Romance and Science Fiction, his time in comics came to an end in 1954. But that was just the early days as Captain America was destined to be brought back to comics thanks to Marvel…but that’s for another update. Steve Rogers was a young man who had a hard life as by the time he was out of high school he had lost both his father and mother and wanted nothing more than to join the army and join the fight against the Nazis in World War II. But due to his small size and health issues, he was not accepted, but was selected to be apart of a secret project called “Operation: Rebirth” lead by Professor Erskine. This project involved a super solider serum that would turn a man into a perfect physical super solider and the key to win the war. Steve takes the serum and takes blasts from a vita-ray machine turning him into a true solider of super nature, but Steve would be the only super solider made as the Nazi’s sent a spy who kills Erskine and this forever seals the secret of the serum. 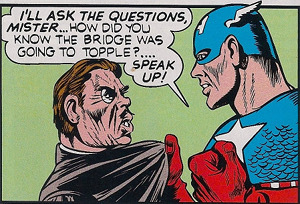 Steve Rogers was sent to fight in World War II as a counter-intelligence agent and a costumed mascot for US that was given the codenamed Captain America! During his early adventures he got a teen sidekick named Bucky Barnes, he fought Nazi’s and super agents like Red Skull and even changed comic companies and became a member of the team The Avengers! Over the years, he has battled such baddies like Baron Zemo, Crossbones, Serpent Society, Baron Blood, Batroc the Leaper, Baron Von Strucker and Hydra. He has faked his own death via an assassination, fought against Iron Man in a superhero Civil War as well as was in a Secret War on another planet. He became a hero named Nomad as well as a member of S.H.I.E.L.D and even had turned into a werewolf. Captain America is a hero who has a rich history and many great stories in his own ongoing series as well as Avengers and cameos he has made in others books as well as mini series. 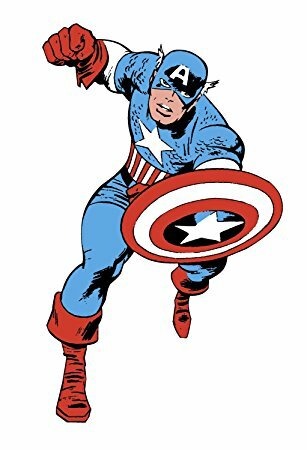 This is just a very, very brief look at Captain America, and I think if you enjoy the movies being done by Disney via Marvel Studios or even enjoy reading comics you should do yourself a favor and go to your local comic shop and pick up some classic Capt comics and enjoy the stories that will unfold in the pages. Hands down Captain America is one of my all time favorite superheroes alongside the Incredible Hulk and has been since I was a very young kid. I can remember talking comic books on the playground with fellow students and them making fun of the fact he was one of my favorites and they would all use the term “boring” when talking about him…now thanks to the Marvel Universe movies from Disney, those same people are now fans of the character! But let’s not harp on the past as it’s a holiday and we should be up and ready for fireworks! I do want to share some of my connection to Captain America as besides always being one of my favorite superheroes, one of my first ever comic books was Captain America # 185, one of my favorite action figures was my Mattel Secret Wars Captain America figure and the only arcade machine I own is Captain America And The Avengers! I want to think Mavericks for having this reprint comic in stock and would also like for remind you all that I grade on a star scale of 1 to 4 and am looking for how well the comic stays to the source material, its entertainment value and its art and story. 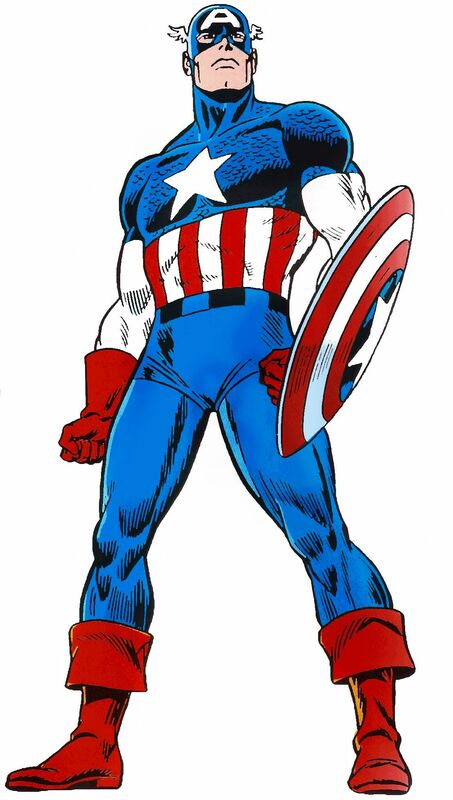 So lets sit back and enjoy July 4th and take a look at the true American icon Captain America! German spies have made their way into the US Army and have been sabotaging and causing lots of mischief and this makes it hard for our top rated officers to trust anyone. But Mister Grover has a top-secret project in the works and takes two top ranked officers with him to witness it. They are lead to a secret lab by Agent X-13 where they watch as skinny Steve Rogers, a man who could not get into the army, is injected with a serum that makes him smarter and stronger and the hero that America is needing. But as the experiment is done, one of the army officers turns out to be a spy and shoots the Doctor, shoots the remaining serum and also shoots and kills Mister Glover! Steve Rogers springs into action and is able to stop and kill the spy and after is sent out to find the spies and help win the war against the Nazis! One night while getting into his Captain America suit, he is found out by Bucky Barns, a youngster who is the mascot of the troop and becomes Cap’s teenage sidekick. 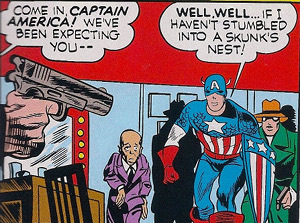 A stage show that features a pair predicting terrible events is getting lots of press and even gets the attention of Captain America and Bucky who go and see Sando And Omar and quickly find out that the pair are spies for the Nazis and have set up the attacks they predicted! Cap and Bucky bring them down, and they find out that Sando is the true mastermind of this con and defeat him. As you can see, to me the first appearance of Captain America is one of the biggest milestones in the history of comic books and for the most part is a very classic and standard comic superhero story as it should be as this is one of the originals to set that bar. The plot of this issue has a group of American agents and scientists taking an unhealthy young man named Steve Rogers and using him as a test subject in a experiment that turns him into the ultimate soldier with a mission to protect America and smash enemies like the Nazis. Once Steve becomes the masked hero, he is discovered by a youngster named Bucky Barns who becomes his masked sidekick named Bucky and together they beat up and stop the sinister plot of Omar and Sando who plan on doing harm to Americans. Really the plot of this first groundbreaking issue is that simple, and yet so good. What works is the fact that Captain America is such a great hero who represents a time in the world when a hero like him is really needed as things were so grim and many of people lived in fear and with unknown futures. Captain America himself is a noble man who loves his country and the people who make it up and is willing to risk his own life to save us from evil of all types. He also is not afraid to crack some heads and bust some crooks when he see’s injustice. Bucky is a goofy teenager who idolized Captain America and upon finding out who the man behind the mask is turns into a skilled crime fighter himself who is always at Cap’s side when the battle starts. The issue’s main baddies are Sando And Omar, a pair of spy conmen who set up terrorist attacks and then predict them at a live stage show, and once found out they are beat up and brought to justice faster than you can read the words “Marvel Comics”. The cover for this True Believers reprint release is well-done and very eye catching for fans of Captain America and also rocks and amazing cover price of only $1.00! The interior art is done by the true legend of comics Jack Kirby and showcases some of his earliest work and his first time drawing Captain America, truly amazing classic comic book work. This is such a great read and fans of classic Marvel, Jack Kirby, Captain America and classic style Superheroes should 100% check it out. A perfect classic comic book with one of the most iconic heroes of all time and one that I can say I truly enjoy from cover to cover. This reprint comic also has a backup story from one of the early Marvel Comics issues and is as well worth the read. Check out below for a look at some of the classic style Kirby art you will see in this issue. Well for me Captain America is the best patriotic superhero ever created as his comics and adventures has always been my favorite to read when comic to costumed heroes. I could go on and on about Captain America but for this Holiday update I will just leave you with this, if you have never read a Captain America comic do yourself a favor and grab an issue or two from the 60’s through early 90’s and enjoy a classic hero of the Marvel Universe. 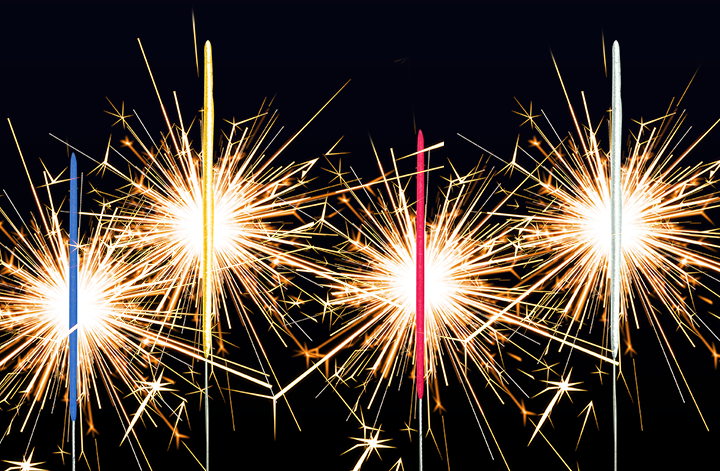 So I want to thank you for spending a part of your July 4th with me, and I hope you have enjoyed some cooked out food and are with loved ones to watch some fireworks on this American holiday. My next update will be about my Monster Bash vacation, and we will take a look at the fourth film in the Romero Dead films Land Of The Dead and the IDW adaptation of the film! So go enjoy Independence Day, and I’ll see you for the next update!